Dominate first-person shooters with Mad Catz' F.P.S. Pro for Xbox 360. 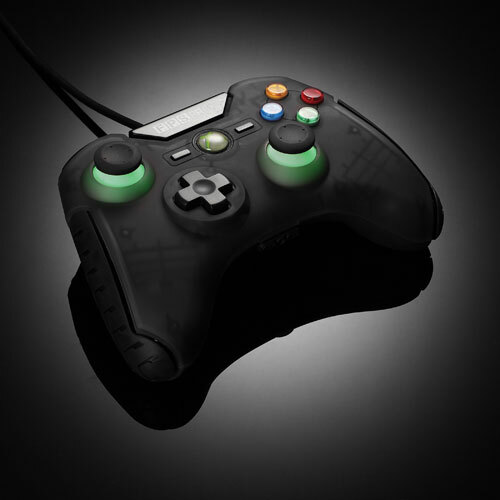 Equipped with a pair of unique, easily-accessible "Combat" buttons for on-the-fly custom remapping; perfectly executed headshots are easier than ever. An independently adjustable LED resides beneath each analog stick to provide immersive backlighting-choose between green, orange or red with the flick of a switch. With a 9.8ft cable to ensure lag-free gameplay, vibration feedback technology to feel all the action, plus ergonomic non-slip grips for extended gaming sessions, the F.P.S. Pro is the weapon of choice for fans of first-person shooters. Get a leg up on the enemy with the improved "Combat" buttons on the F.P.S. Pro Controller. Located right where your ring fingers normally grip the bottom of the controller, these new larger, textured buttons are even easier to find and can be operated without the need to remove your fingers from other controller buttons. A simple selector switch allows for quick and easy remapping of the "Combat" button function. New quick-fire triggers now feature a shorter throw and better spacing to provide optimal response in all situations. They reside close enough to the bumper buttons so that you can toggle between the triggers and bumpers with minimal finger movement. Unique firearm-inspired grips with a soft-touch surface enhance comfort and control. They're ideal for marathon gaming sessions when comfort matters most.